WHY USE ALL AROUND TALENT: Ad agencies will save time and money in the casting and production process via All Around Talent, it enables them to select professionals and work with them directly, giving them increased value on their investment. Projects are completed quickly, money is saved by working directly with talent. Payments for the talent hired can even be made via Paypal ensuring not only a satisified Ad Agency, but satisfied talent with swift payment. Advertising agencies submit a project request and can listen to professional voice over artists nationwide read their script. Once talent is chosen, the ad agency has the opporunity to influence and participate in the creative process via ISDN without flying to a location for the recording. 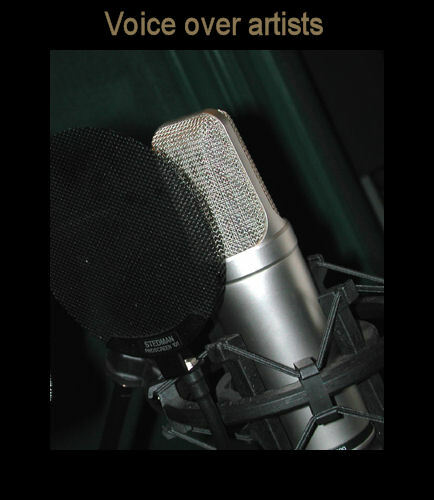 All Around Talent books voices for a diversity of applications such as television commercials and station imaging, television documentaries and series', radio commercials and station imaging, jingles for broadcast, audio book narration, storyboards, animated features, corporate presentations, telephone systems, Internet narrations, eLearning applications, and many more. NOTE: Contracts must be signed with All Around Talent LLC in order to prevent voice theft. ALL AROUND TALENT LOOP GROUP: Don't forget whether you need authentic New York accents, southern dialects, Spanish or Asian accents/speakers, general restaurant ambiance, kids in the park, etc. we can provide the voices. We can pull together a loop group of superb professionals with the needed improvisational skills and experience for your voice over project.